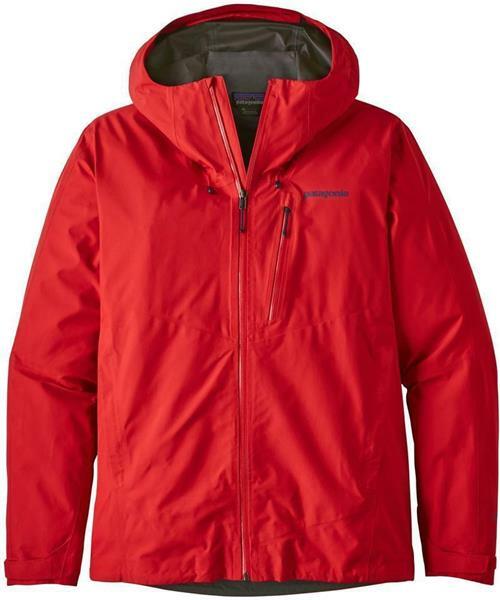 From summertime thunderboomers through spring snowfall, on alpine rock or backcountry tours, Patagonia's new Calcite Jacket stays light, durable and stormproof. It’s built with a packable 2.5-layer waterproof/breathable Gore-Tex Paclite® Plus fabric that has a 100% recycled polyester face and a special textured backer for next-to-skin comfort. The hood is alpine helmet compatible, with a laminated visor and an easily adjustable single pull. Pit zips help ventilate, its zippers repel water, and three secure pockets (exterior left chest and two handwarmers) hold your valuables. With minimal self-fabric hook-and-loop cuff closures, a dual-adjust drawcord hem, and DWR (durable water repellent) finish.